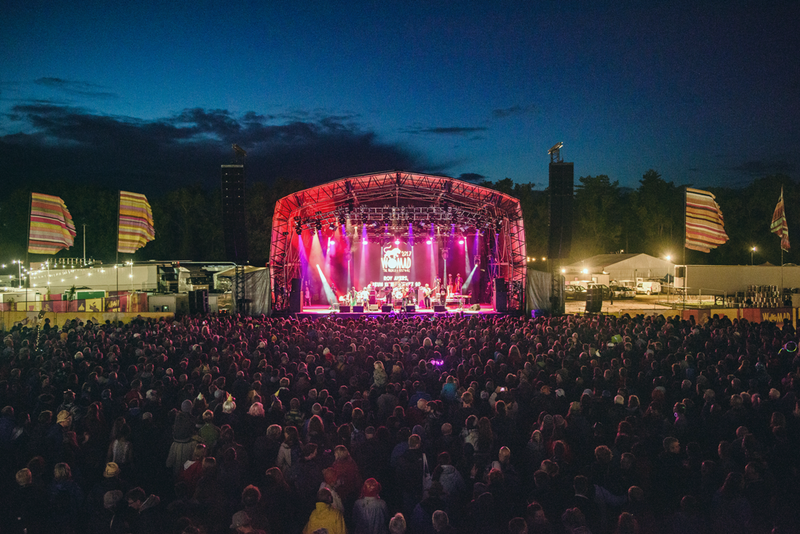 WOMAD has always boasted a strong club element to its line-up over the years, from the legendary Whirl-Y-Gig all-nighters in the ’90s right through to the delights of the ever-popular Big Red Tent at the current site in Wiltshire. 2018 is no different, with the likes of Leftfield, Macka B and Jazzanova featuring Paul Randolph already signed up to get the party started in Charlton Park from 26 – 29 July, and even more names from clubland royalty being added to the line-up today, from genre-defying DJs to sharp-thinking rappers to dancefloor-filling bands. Taking to the WOMAD turntables at the Big Red Tent will be dance music pioneer Gilles Peterson, who makes a long overdue return to play the world’s biggest global party. His set will no doubt be a glorious fusion of soul, jazz, hip-hop, house and everything in between, brimming with passion and sound. Joining him for his WOMAD debut will be Clifford Joseph Price MBE – aka Goldie – who has blazed a trail through British dance music for more than 25 years, a leading light in the rise of jungle from the underground to the mainstream. The ebullient folk singer and fiddler Eliza Carthy continues on her mission to take British traditional song to places it has never been before with her latest project, The Wayward Band, featuring a ‘who’s-who’ of names in the folk world and whose live shows are exhilarating adventures in keeping traditional music vibrant and contemporary. Bringing musical mastery and a whole lot of fun to the Big Red Tent is the terrifically versatile outfit The Herbaliser, experts in fusing together jazz, hip-hop and breaks, and once again teaming up with one of their long-time collaborators, the rapper RODNEY P, for a very special WOMAD set that will bring the house down. After joining friends Blue Lab Beats on stage at WOMAD 2017 for an energetic, powerful set, spoken-word poet and multimedia artist Kojey Radical is back, this time making his solo debut on the Siam Stage. His work spans every genre possible and he excels at every one of them; from music to visual arts to poetry, the British-Ghanaian Londoner uses rich, fearless lyrics and imaginative beats to create a brilliant, unprecedented sound. BCUC (South Africa) With a name standing for Bantu Continua Uhuru Consciousness, this seven-piece from Soweto put some genuine edge back into South African music. They call it ‘afropsychedelic’. House Of Waters (USA/Japan/Argentina) The hammered dulcimer is an instrument less seen, but in the hands of New Yorker Max ZT, it creates a rich tapestry of sound, one capable of adding genuine depth of emotion to this trio’s jazz-wise creations. JM y Juanín & Los Crack del Puerto (Chile) Take two elder statesmen singers from the Chilean port city of Valparaiso and, after a lifetime of singing largely to their local neighbourhood, feed their charming, acoustic songs to a hungry world. Maâlem Hamid El Kasri (Morocco) Master-musician Hamid is one of the leading purveyors of the North African music now as gnawa. Armed with a surprisingly versatile three-string bass lute known as a guembri, he’ll make sure the rhythm is going to get you. MarthaGunn (UK) Young five-piece from Brighton who, just a couple of singles into their career, have a pleasingly mature and well-formed sound, one best described as 21st-century folk-rock. Ones to very much watch. Mélissa Laveaux (Canada/Haiti) Electric guitar-toting singer with a breathily alluring voice who, having submerged herself deeply into the cultural heritage of her Haitian parents, has surfaced with her music dripping in echoes of her ancestor’s music. My Baby (Netherlands/New Zealand) Amsterdam three-piece with an attention-grabbing amalgam of swampy blues, dirty funk and psychedelia. With emphasis always turned towards the groove, let this trio take you higher – and lower. Sabry Mosbah (Tunisia) The cultural expressions of black Tunisians rarely gets exposure, but this very popular singer-songwriter has punched through those difficulties, at the same time fighting against the racism encountered by his people. Seramic (UK) A one-man whirlwind (admittedly with a little help from his friends – including one Bootsy Collins), Seramic occupies the precise point on the map where soul, funk and rock intersect. Think Hendrix, think Prince. Too Many Zooz (USA) With a signature sound known as ‘brass-house’, it’s no surprise to learn that this New York City trio – who honed their sound busking in Big Apple subway stations – create high-tempo dance music through the medium of drums, trumpet and baritone sax. Wazimbo (Mozambique) Veteran Mozambican singer whose songs soundtracked the hope and expectation of a new nation-state following the decade-long civil war. His style is marrabenta, music previously subjugated during Portuguese colonial rule. Yazz Ahmed’s Hafla Band (UK/Bahrain) Forward-thinking trumpet/flugelhorn player who has played with Radiohead, Lee ‘Scratch’ Perry and Joan As Policewoman. As she investigates the relationship between jazz and the Middle East, Yazz enhances her music with subtle electronica.